This narwhal craft is perfect for an ocean theme, or for kids who are heading off to the beach this summer. 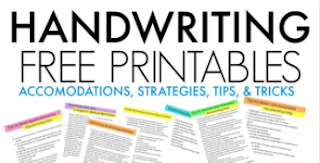 Sometimes, adding a themed craft to a favorite children's book is just what kids need to get crafty while working on skills like scissor use and fine motor skills. 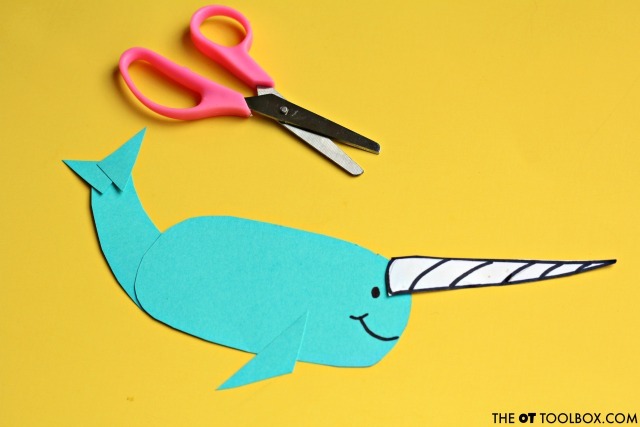 We used one of our favorite new books, "Not Quite Narwhal" by Jessi Sima to come up with a fun narwhal craft that is heavy on the scissor skill practice. If you are looking to help a child with scissor use, we've got TONS of scissor skill activities here on the site. This narwhal craft was a fun one for us! I have a few girls in the house who are crazy about all things mermaids, unicorns, and rainbows. While an actual narwhal has nothing to do with these things, there is just something fun and whimsical about narwhals! 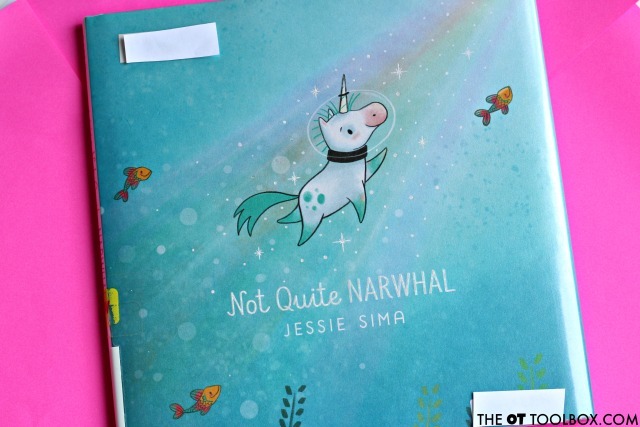 When you read Sima's Not Quite Narwhal, you definitely feel the fun and whimsy of unicorns and narwhals! We picked up the book in the new release section of our library and it has quickly become a hit in our house. This book is a creative and fun story about Kelp, who is born among the narwhals but always thought he seemed a little different. One day, Kelp is carried by a current to meet mysterious creatures who seem more like him and make him wonder if he might not be a narwhal after all. This is a sweet library book find that we'll definitely check out again!! You know those books that show up in your library bag again and again. We've been reading Not Quite Narwhal over and over again and noticing new adorable details in the illustrations with each read-through! We decided to make a few narwhals of our own to join Kelp in his adventures! 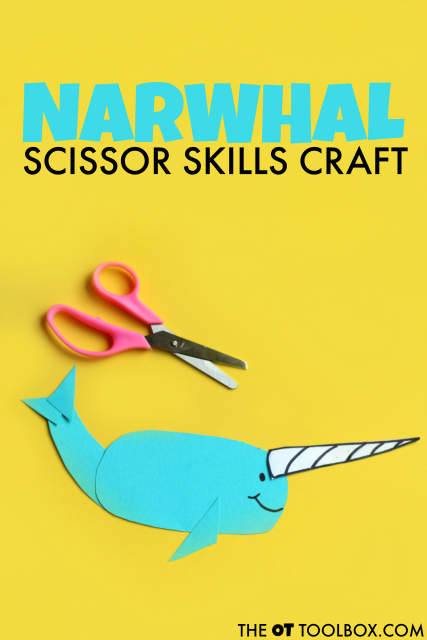 This narwhal craft has double duty: It's super cuteness goes along perfectly with the book AND it sneaks in scissor skills. 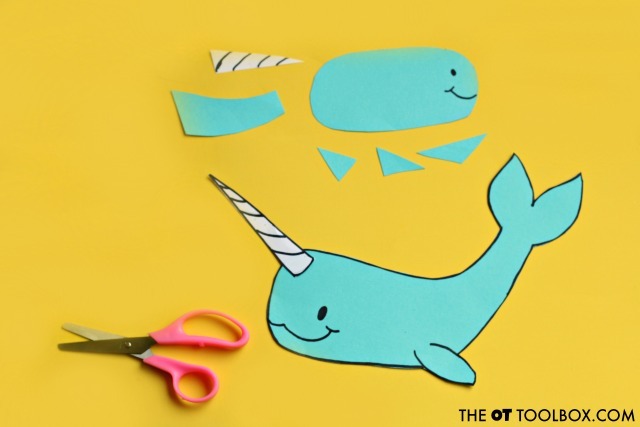 Kids can work on cutting on lines with simple shapes in order to build a narwhal. We made an easy version with simple geometric shapes and a more complex narwhal craft that would be perfect for older kids. 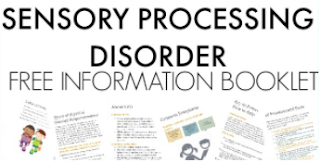 If you're working on scissor skills, The Scissor Skills Book is a resource for parents, teachers, and therapists. 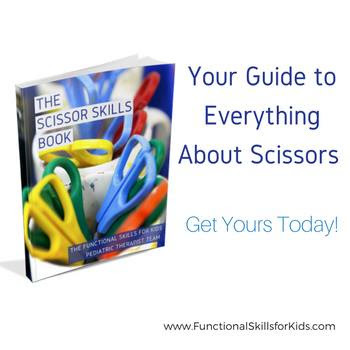 Read more about The Scissor Skills Book HERE. 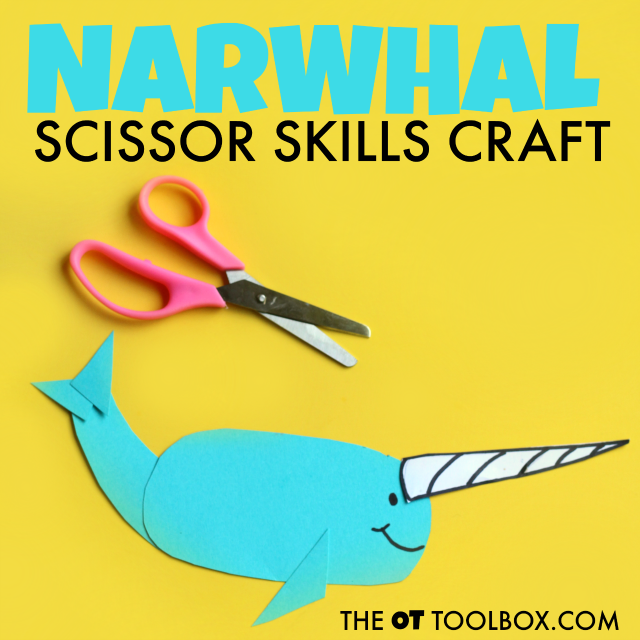 Kids can cut on the lines and build a narwhal. Use the picture above to construct the narwhal. 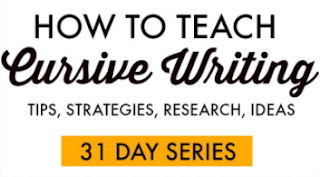 You can also use this craft as an opportunity to develop visual perceptual skills like form copying and eye hand coordination. It's a lot like building pictures with tangrams! 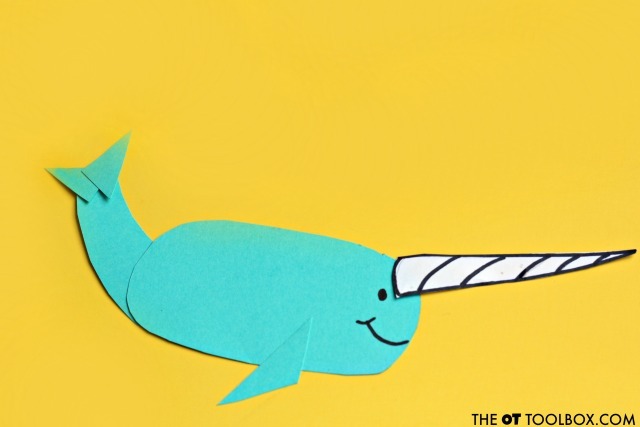 For a more complex craft, draw the narwhal on the blue cardstock in one big, and curved shape. Cutting on lines with multiple turns is appropriate for young tweens and older kids. Let me know if you make this craft. We shared our version on our Instagram page. Post yours on our Facebook page. 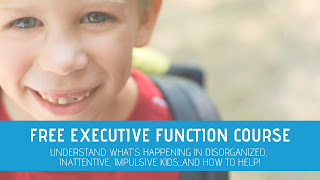 I would love to see your child's work! Find more crafts that address skills like scissor skills, direction following, and fine motor development on our crafts for kids page.